Nice! 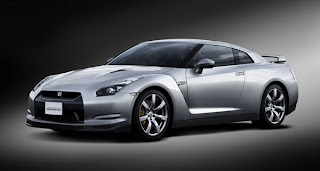 Nissan has announced that the deliveries for their 2009 Nissan GT-R Supercar is set to begin on July 7, 2008. This powerful 480 horsepower, twin turbo, 3.8 liter V6 engine monster has been coveted since it was first announced and the first batch of pre-orders that was taken last January has all been spoken for. And why wouldn't the Nissan 2009 Nissan GT-R supercar not be coveted? With it's sleek styling that uses advanced aerodynamics, body that utilizes steel, carbon fiber and die-cast aluminum, it would definitely turn any body's head. For those lucky ones that was able to bag this baby, get your garage ready. And for those International buyers that just couldn't wait for the 2009 Nissan GT-R Supercar to arrive on their shores, you better contact an Auto Transportation Worldwide service so you can have this baby at your doorstep come August.